14' Huge Commercial Silver 3-Finish Shatterproof Christmas Ball Ornament Garland. Huge Shatterproof Christmas Ball Ornament Garland Item #N104607. This very unique, hard to find item is perfect for commercial decorating! Onlookers will be amazed by its size and beauty Shatterproof ornaments combine the beauty and luster of real glass with the unbreakable practicality of plastic. Additional product features: Commercial sized Color: silver Finish: shiny, matte and glitter 5-piece easy assembly Recommended for indoor use only - if using outdoors place under a covered area. Dimensions: 14 feet long x 11 inch diameter (at widest point) Material(s): durable plastic. 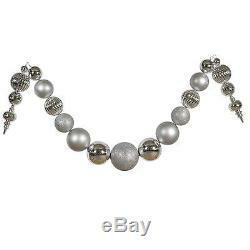 The item "14' Huge Commercial Silver 3-Finish Shatterproof Christmas Ball Ornament Garland" is in sale since Friday, July 15, 2016. This item is in the category "Home & Garden\Holiday & Seasonal Décor\Christmas & Winter\Ornaments". The seller is "christmascentral" and is located in Buffalo, New York. This item can be shipped to United States.